Black Light Mini Golf is a fun family attraction, located in Harbour Town, Docklands, Melbourne. Black Light Mini Golf's interactive, indoor 'glow-in-the-dark' golf course is one-of-a-kind family entertainment and proves to be greatly atmospheric, as it features many imaginative props, mood-lighting and immersive sound effects – creating a memorable experience for children (age 5 and over), teenagers and adults alike. Unique to Black Light Mini Golf, is it's detailed 18-hole golf-course, which is painted with a florescent colour palette and overcast in 'black light' (aka UV Light). This special lighting and technical design allows miniature golf enthusiasts, beginners and experienced players alike, to play the fun yet challenging vibrant golf-course, which references distinctive Australian themes, locales and icons - in the 'dark.' Some of the favourite courses, according to owners Michael and Julie, include the 'Kingswood Ute,' the 'Daintree Forest' and 'Cave'. It is advised that participants wear white, as it is the most visible colour in the dark lighting and players can also wear 3D glasses to enhance the experience.What's great about the price is you can enter the facility as either a participant ($13 Adult /$10.00 Child) or as a spectator at only $4.00. So either the whole family can join in and play at the discounted fee of $40.00 (2 adults and 2 children) or the kids can play, while parents encourage from the sideline. Also Glow Sticks and Drinks are available at $1.00. Currently there is a special deal available in which a family of four can enjoy a round of golf at Black Light Mini Golf and a meal at Nando's for only $52.00 on Monday, Tuesday and Wednesday. This venue, which can hold up to 72 individuals, can also be hired out with unlimited games and catering for special occasions, whether it be a birthday party or corporate function. Contact Michael and Julie at Black Light for details. Black Light Mini Golf is open seven days a week - Monday to Wednesday (10am-5pm), open late Friday and Saturday (10am -11pm), and Sunday (10am-4pm). 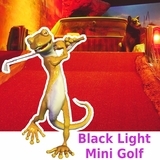 Keep up to date with special events and deals with the Black Light Mini Golf Facebook. Why? Mini Golf in the Dark! When: Black Light Mini Golf is open seven days a week - Monday to Wednesday (10am-5pm), open late Friday and Saturday (10am -11pm), and Sunday (10am-4pm). Where: Level 1, Shop 35, Star Crescent, Docklands Harbour Town. Melbourne, Victoria 3008. The opening hours have changed, they are now 12 noon to 8pm Monday to Thursday. 10am to Midnight Friday and Saturdays and 10 to 6pm Sundays.